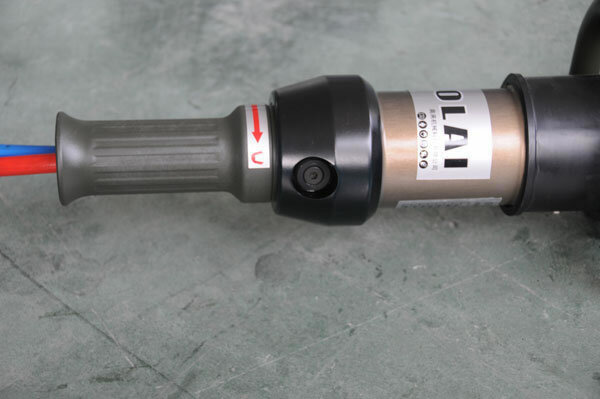 Made of high strength light alloy for aerospace, the hydraulic cutter B is especially designed to dismantle the metal construction with round bar, section bar, cable, pipeline and deformed steel bar and plate to make the sufferers saved. 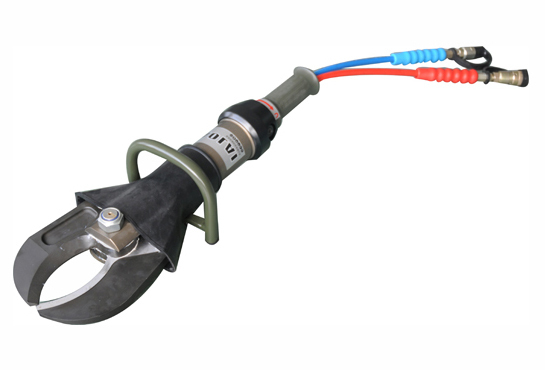 With the advantages of light weight, strong cutting power and short time consumption of shears opening and closing, the equipment performs perfectly in accelerating the rescue process. 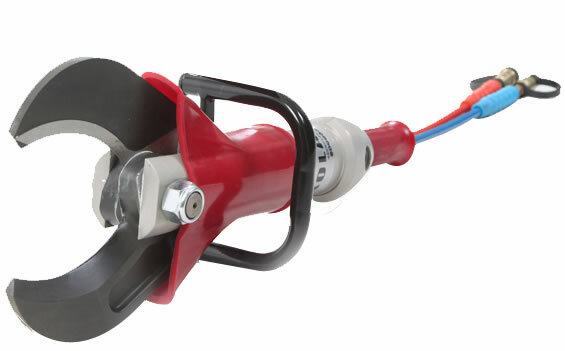 The hydraulic cutter has been widely used in rescue service for traffic and railway accident, earthquake, building collapse, airplane crash and shipwreck. It must be connected to power packs when working. Description 1. 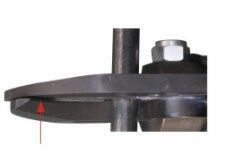 Material: The high-quality heat-treated tool steel is made into the shearing blade of the hydraulic cutter B. 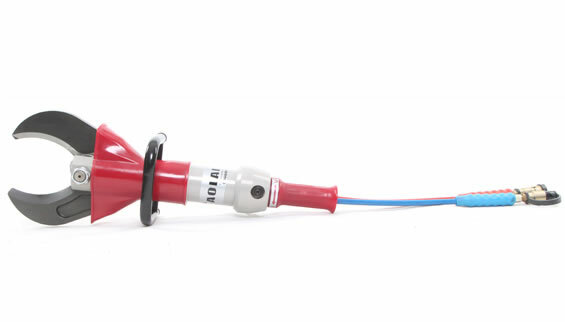 Its anodized surface features good wearing resistance performance. 2. 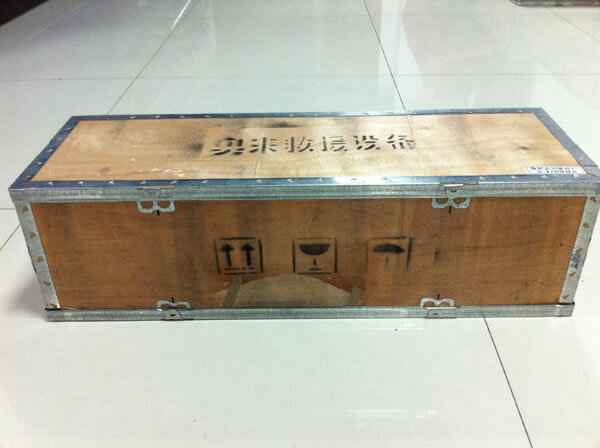 Function: It can easily and quickly cut off the vehicle parts, metal structure, heterogenic steel pipe, steel plate and so on. 3. 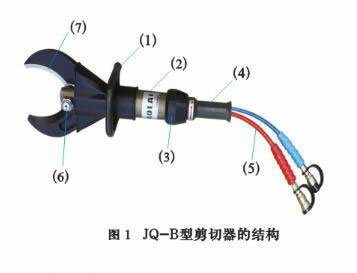 Application: The hydraulic cutter B is applied into the rescue work for the highway or railway traffic accidents, the earthquake disaster, shipwreck and building collapse. Features 1. The automatic reset manually valve and the protective cover for preventing the splash secure the safety of the users during shearing. 2. 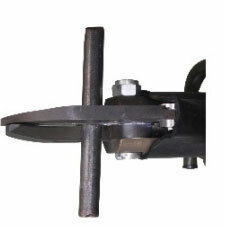 The blade could fix in any position and maintain stable during shearing to ensure safe operation. 3. Both left-handed and right-handed people can use this shear. 4. 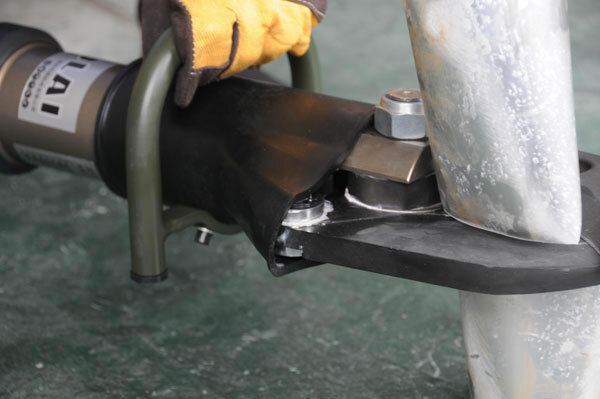 The hydraulic cutter B is designed according to the ergonomic principle, so the material could be easily pushed to the center of blades with the biggest shearing strength. 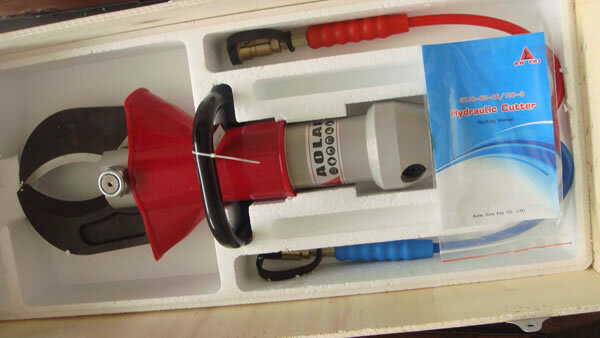 By connecting the motor or hand hydraulic pump through quick connector, the hydraulic fluid is supplied to the hydraulic cutter. 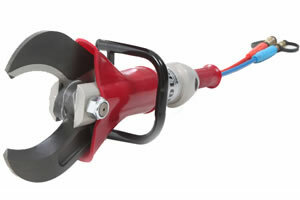 Through the connecting rod, the hydraulic pressure acting on the piston is transformed to the rotation of the shears. 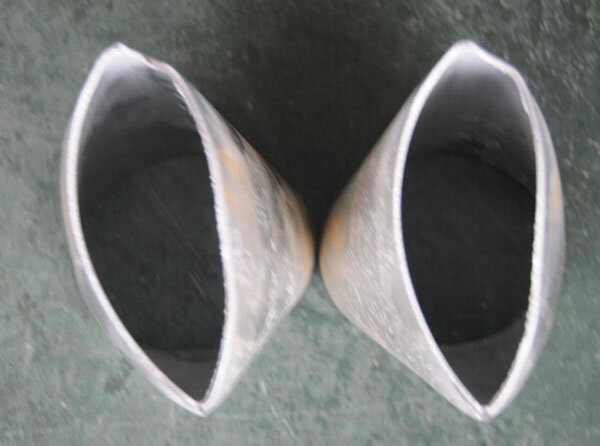 Then, the cutting material can be sheared to achieve the rescue service. 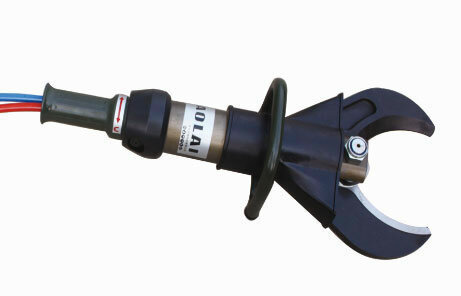 The opening and closing of the shear is controlled by the manual reversing valve. When the manual reversing valve is at the central position, the shear cannot move, and the equipment is at the state of oil return. 1. 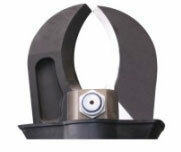 With the protective cover available for the movable part, the shear is made by the regrinding tool steel. 2. 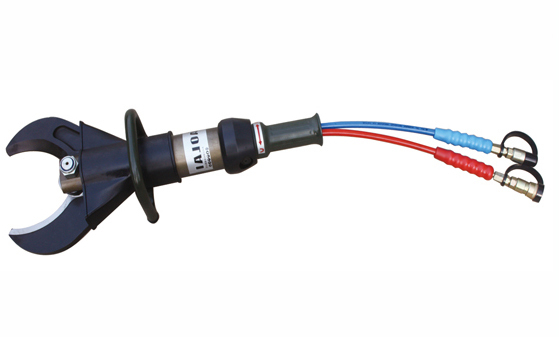 The accessories of protection against splashing and automatic reset manual reversing valve are available for safeguarding the operator. 3. The shape of the blade is designed basically according to the ergonomics, which can make the cutting material in the blade center with the biggest cutting power easily. Our company is an experienced hydraulic cutter manufacturer and supplier in China. 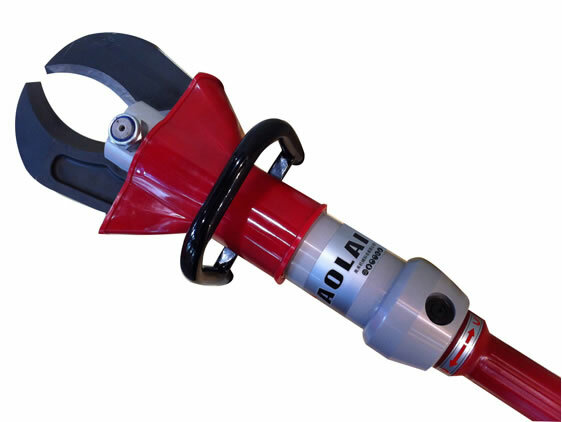 We offer a variety of products, including hand operated combi-tool, hydraulic jacks, assist rescue tools, hydraulic spreader, among others.